Hamilton Sorter systems are built to last, using high-pressure laminates and custom-designed aluminum extrusions. And because our furniture can last a lifetime, we build in flexibility with modular construction. So the system you buy today can change with your needs. Hamilton Sorter's Mailroom Systems let you significantly improve sorting productivity while making the best use of available floor space. The System is often created by combining two single stations and a unique corner unit. 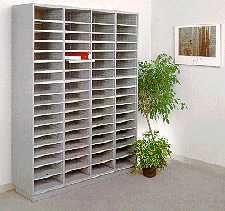 This provides more sorting capacity and makes better use of often wasted corner space. The System's new, ergonomically designed console edge eliminates uncomfortably hard corners, while sorting modules feature adjustable shelving with full width indexing for easy reference. The free standing, modular design of the Hamilton Sorter Mailroom System allows it to be easily rearranged should your needs change. It's available in a wide range of laminate finishes and comes complete with a limited lifetime warranty. 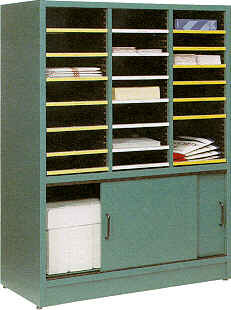 With shelves that easily adjust in one inch increments, these Hamilton Sorter Storage Modules provide custom fitted space for storing everything from literature, forms, computer print-outs, and newspapers to fax, copier, and laser printer supplies. Where space is at a premium, Hamilton Sorter Storage Modules do double duty as Satellite Mail Centers. 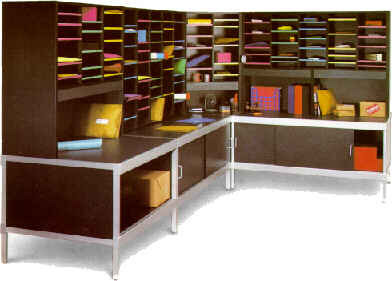 Forms, literature, computer print-outs, newspapers, finished copy jobs, mail, and copier supplies are all instantly accessible in Hamilton Sorter Multipurpose Organizers. Easily adjustable shelves maximize space utilization, and color coded full-width indexing minimizes search time.